Today I enthusiastically installed OSX Lion on my development system. I was probably stupidly naive to think it would be a straightforward upgrade. 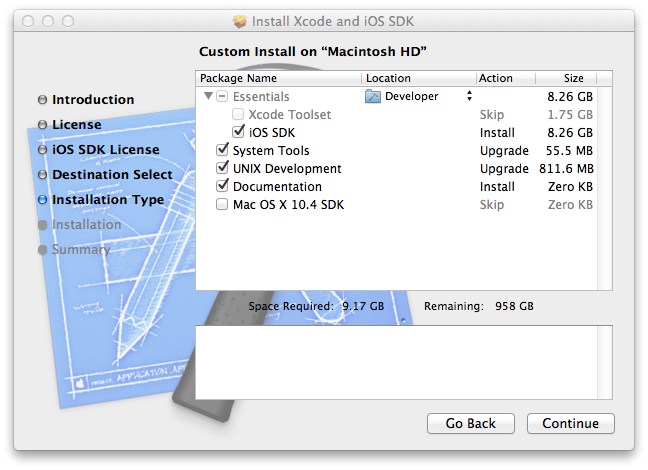 Attempting to install Xcode 3.2.6, the version I currently prefer, it seemed to silently fail. I wasn't sure why. I did notice running the installation wizard; that at the point of selecting Installation Components the Xcode Tool Set component (Usually compulsory) was greyed out and marked as skip. After some research, It seems support for Xcode 3.2.6 on Lion is somewhat neglected as Xcode 4.x is the future. Long story short I needed to use 3.2.6. It can be motivated to install on Lion. UPDATE: Using this method in more recent times this installation method can still fail. This is due to software packages having expired certificates. You can fix this problem by setting your system date to 1 March 2012 or earlier during installation. This will allow the software installer to complete without error. Afterwards you can resent the date and time to the correct date and time.